Thinking about investing in a new camera? If so, you know it’s tough to make a decision, and it can be quite the struggle to find one that suits all of your needs and fits in your budget. Also, with new cameras and great new features coming out constantly, it becomes a challenge to pick a camera with some staying power. So what do you do? The best thing to do in this situation is to analyze your needs, see what is available, and weigh the pros and cons. This post will tell you what you need to know to make sure you find the camera that works best for you. This is the most important factor in determining your camera purchase. What you shoot most will affect all the points below. Whether it’s interviews, documentaries, commercials, stop-motion, 3D movies, green screen, broadcast, weddings, etc. you will be glad you thought about this before making any decisions. It will help you determine if you need a specialty camera or a more universal camera that can cover lots of needs. When talking about format, I am referring first to the final video project’s format. Will your projects be going to a movie theater screen, a website, YouTube, mobile devices, etc.? Secondly, I am talking about the actual format that the camera records. Both of these will play an important role in your decision. Cameras differ greatly from each other in terms of the way they handle compressing the video information they record. It becomes a file size vs. quality battle, choose wisely. Color sampling plays an important part in the image quality your video camera will be able to capture. For example, a professional dedicated video camera’s color sampling will be superior to that of a DSLR’s. This comes in handy when shooting on a green screen. Getting a good clean key in post production will be easier if the footage was shot on a camera with great color sampling. Make sure your camera suits your audio needs. Until recently, most DSLR’s have had sub-par audio capabilities. This is a huge advantage that professional dedicated video cameras have over DSLR’s. You want to make sure you have XLR inputs, as well as a way to monitor your audio while recording. Whether it’s just an LCD, or you are running HDMI out to a big screen television, you need to make sure you can monitor what you are recording (video AND audio). Make sure you choose a camera with the right monitoring options for you. You need to determine if you need a camera that has an interchangeable lens option or not. If you get a camera that does not, you are stuck with that lens, which could be good or bad. This is where you consider zoom range, aperture, etc. With DSLRs you can always find a lens that suits your needs, but they can get quite expensive if your day to day requires many focal lengths, low light situations, Image stabilization, etc. Low light capabilities are largely affected by the size of the image sensor in the camera. In low light situations, digital video can often get grainy/noisy. You can get cleaner low light footage with better sensors and/or with a lens with a wide open aperture. Depending on what you shoot most, portability can be a big issue. It can be the difference of using a large broadcast camera for a news station or using a tiny GoPro camera attached to a snowboarder’s helmet for a sports/action video. The Avengers movie even used a few DSLRs for some of the scenes that required more portable cameras to shoot. Ask yourself if you will you be shooting handheld, need a tripod, a shoulder rig, a steady cam, etc. Most video cameras have stabilization built in, however with DSLRs, the stabilization is dependent upon the lens that’s mounted. Image stabilized lenses are more expensive than those without. Lots of times stabilization will depend on other equipment, not just the camera. Do you need a camera that is easily customized? RED cameras aren’t cheap, but you can customize them in pretty much any way you want. You may need a camera that you can attach lots of accessories to? This all depends on what you shoot most, and there are loads of DIY projects for customization out there. Now that you have considered these points, you should be ready to determine the right camera for you. Categories: Photography, Video Production | Tags: camera, camera purchase, dslr, dslr video, video, video camera | Permalink. If you have not had the chance, please visit the Rising Stream Media blog. I write for that now, and below you can read a re-post of my most recent blog for RSM. Capturing good sound with your video projects is incredibly important. Some would even argue that it’s just as important as capturing good quality video. DSLR cameras are fantastic for capturing cinematic quality video, but they are notorious for their sub-par audio capabilities. Their built-in microphones would capture acceptable audio if recording in a quiet area and very close to the subject, however this is not the typical setting for most productions. Most DSLRs are equipped with a small hole to record audio, and sometimes it is not on the front of the camera. Also, there is a monitoring issue with most DSLRs, until some recent models (Canon’s 5D Mark III), the cameras have not had a way to output audio for monitoring during a production. These are some downsides to capturing audio with a DSLR, but if you know how to jump over these hurdles, there are ways to get great audio to sync up later in post production. There are many different options to capture separate audio for your DSLR video project like wireless lavalier microphones, boom microphones, XLR boxes, handheld microphones, shotgun microphones, etc. For DSLR audio recording, there are a few diverse little products out there that are affordable and will help produce great results when working with any type of these microphones with an XLR input. 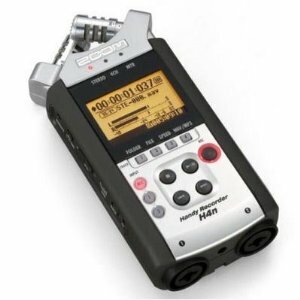 The Zoom H4n and the Tascam DR-40 have become standards for capturing audio for DSLR videography, and they are both capable of 4-channel recording to 2 separate stereo tracks. 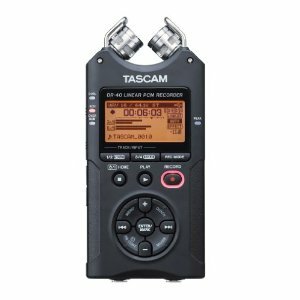 The Tascam has a friendlier price point for a very minor difference in features. Not only can you plug in different microphones for different setups, but both of these recorders also have their own built in recording capabilities that aren’t too shabby. You can plug headphones directly in to both products for monitoring, and they each sport manual controls to find the sweet spot for your recording situation. Either one of these products is a great addition to anyone’s DSLR production arsenal. Categories: Video Production | Tags: audio, boom, camera, dr-40, dslr, h4n, lav, rising stream, samson, tascam, video, zoom | Permalink. Recently, I got my hands on a really neat piece of equipment that I ordered with the intention of just trying out at a wedding for some interesting shots. Now, I think I will find a lot more uses for it. The Pico Flex Table Dolly is a very affordable, portable, and professional quality table dolly. This dolly has enabled me to get some very interesting shots with my Canon T2i. It will work well with pretty much any other DSLR too, and even Smartphones, GoPros, point-and-shoot cameras, etc. The Pico Flex Table Dolly sports adjustable wheels making it great for getting general dolly/sliding shots, or even sweeping all the way around an object in a circle. It is a very handy tool to have for relatively small product shots, and helps you get a great smooth dolly shot. The only downside I have found so far is it’s inability to hold up the heavier model DSLR cameras with long lenses. For instance a Canon 7D with a telephoto lens mounted to it would not be ideal for the Pico Flex Table Dolly. For more information on the Pico Flex Table Dolly, please check out CheesyCam.com and view their videos on the product too. Categories: Video Production | Tags: 550d, canon t2i, cheesycam, dolly, dslr, pico, pico flex dolly, t2i, video production | Permalink.